Case: I have a VFD installed at my plant to run a 500 hp motor. Recently we had an incident of motor tripping on Ground Fault. The motor's insulation resistance was tested & the results showed that winding was grounded. After repair, the motor was again connected to the VFD & started but the VFD tripped the motor on "Inverter Ground Current". I checked the insulation resistance of motor & cable but the values were in Mega Ohms. I even checked the VFD physically to ensure that the inverter is not grounded & everything looked fine. When I run a smaller motor of 75 hp, it runs OK but with that 500 hp motor, the inverter ground current fault persists. Answer: With a variable frequency drive (VFD), the voltage seen at the motor terminals will be in the range of 650VDC minimum and greater depending on the length of the cable to the motor. A DV/DT filter, not an expensive sine wave filter would certainly be an option in VFD output. However unless the 75HP motor was tested with the same cable as is connected to the 500HP motor, the cabling could also be at fault. As you mentioned, one of the windings was grounded which could have the potential of overheating the cable and degrading its insulation. 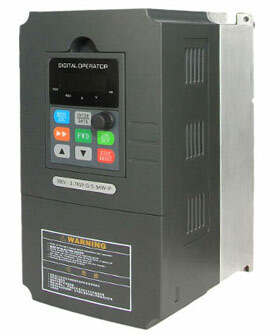 A filter per se will not solve ground fault tripping on a VFD, however a dv/dt filter will solve future problems from happening by eliminating punch through of the insulation due to spikes generated by an IGBT design VFD which usually exhibit fast rise times and decay times of the PWM pulses. Long motor leads will amplify the problem due to a potential impedance mismatch between motor and VFD, this will increase the voltage at the motor to values in excess of 1000Volts. If the insulation of the motor windings is not up inverter rated standards problems will result sooner rather than later. The resultant pinholes in the insulation are generally observed in the first 2 to 3 windings of the motor as either phase to phase or phase to ground shorts. The carbon deposits caused by the corona can cause leakage points within the motor. By the way, a motor with these pinholes in the insulation may run perfectly well when run in bypass or across the line since it is not subject to the PWM waveform of the VFD. In my 40 years of working with VFDs I have rarely found the drive to be at fault insofar as ground fault tripping is concerned. In most cases the problem lies with cabling insulation issues, especially since this motor was recently repaired. By repaired I mean rewound to inverter duty specifications and assumed good. Not knowing the expertise of motor shops in China that may be a big assumption on my part. I know there are thorough motor shops in this country (USA) I also know there are bad ones. I am sure China is the same.